“How much?” Penny exclaimed. “That’s just extortionate!” And so she settled down to do what she does best. 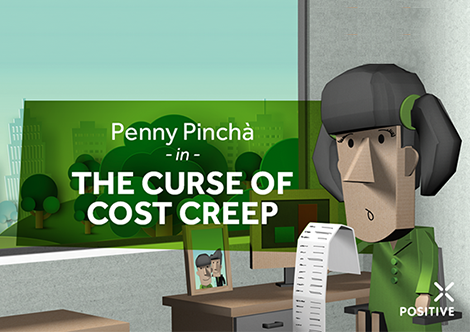 It’s not by accident that Penny Pinchá is known as the Penny who looks after the pounds. With a penchant for optimising profits, her common-sense approach to financial frugality has helped Positive’s clients maximise their marketing ROI many times. Penny was excited. Dynamic Dan had just rushed past her office, advising her of a new multichannel opportunity with a great new client and to expect a meeting invite to be introduced to a new client. Before dashing off, he had quickly thrust an outline brief into her hands along with some seriously high competitive quotes. Their requirement was complex; a fully personalised multichannel campaign with print, landing pages, emails, SMS, social media, mobile media and imagery. But there was something missing. “How on earth are they going to measure success without metrics?” cried Penny as she got out her favourite red pen, preparing to get all forensic about the financials. After a couple of hours, Penny sat back satisfied. Not only had she identified how to avoid cost creep, she’d also included a user-friendly dashboard to track the effectiveness of the campaign, right down to a per customer level. The quality of the data would more than justify the marketing investment, and still mean Positive were working within the parameters of the budget. “Positively perfect,” beamed Penny, excited in the knowledge that the improved customer engagement and greater quality of dales would help boost the campaign ROI. as the Penny that looks after the pounds”. Whether you need to simplify processes, go to market quickly, or just want to ensure you achieve your revenue goals, we can help.